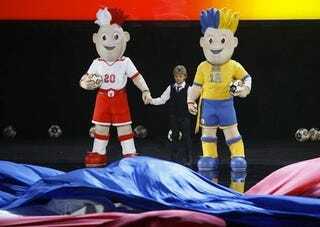 Poland and Ukraine, cohosts for the 2012 European Football Championship, unveiled their mascots today. Take a glance now, and study them at leisure when they come to you later tonight, in your dreams. Standing over you. Staring. The twin dead-eyed abominations don't actually have names yet, because names give them power. But you can vote, if you're so inclined for "Slavek and Slavko," "Siemko and Strimko," or "Klemek and Ladko." If you pick the winner, perhaps they'll spare you when the Darkness comes. There's a tradition of double mascots for co-hosted tournaments, as Austria and Switzerland in 2008 turned to Trix and Flix, who look like Eurotrash versions of The Noid. We have less than two years to prepare ourselves, or just make peace. Perhaps Wenlock and Mandeville are the world's only hope.